Solelia pitched its charging stations for electric cars and presented “Solbanken” where you save solar power to use on a cloudy day. 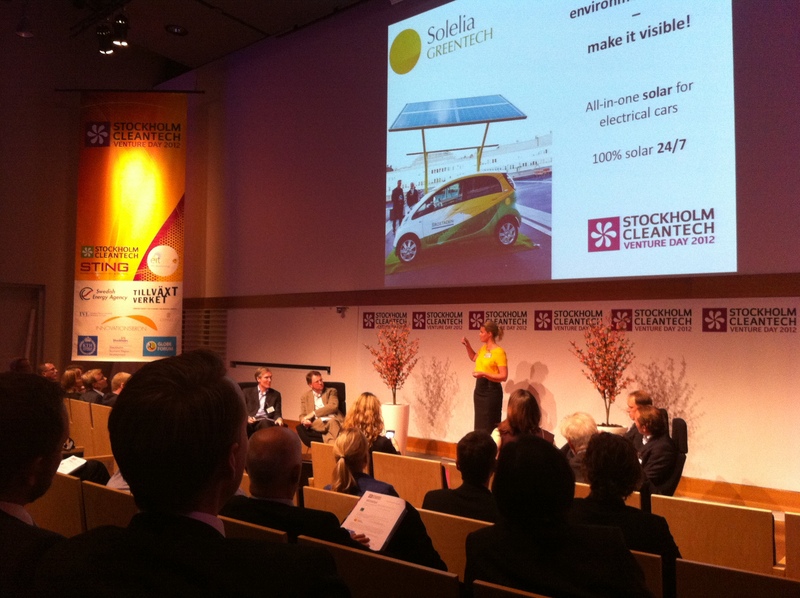 Last week, 19 new cleantech ideas were presented at Stockholm Cleantech Venture Day, which was held for the fifth time. The scene was set for meetings between investors and entrepreneurs, and for sharing industry insights. Notable during the conference was Her Excellency Ambassador Najla Al Qassimi’s description that the initiative in the United Arab Emirates to create Masdar City is pushed as a way for the country to reduce its strong dependence on fossil fuel (owned by the emirate and not the country). From India and Mr Raghupathy, CEO of the Confederation of Indian Industry, we learned that the cleantech business has been growing by 25 percent annually for the past 10 years, and is expected to continue at this rate to offer at least 1.4 million jobs by 2020. A major challenge is to reduce the energy consumption, which is enabled through a green building movement, to ensure availability of energy by implementing renewable energy solutions, and to provide clean water for more people. Mr Jussi Nykänen of GreenStream Solutions in Finland described their work in China and their involvement in arranging funding and technologies to allow a shift away from the fossil based economy and to switch to renewable energy on a larger scale. He also shared his guidance, based on several years of experience, on how smaller companies can approach the Chinese market. A Cleantech Countries Innovations Index from the Cleantech Group/WWF was presented from which it was evident that three out of the top four countries are Scandinavian! This offers an excellent investment opportunity as there are apparently a range of good prerequisites to build cleantech companies in our region. As a highlight, 19 companies gave well-rehearsed pitches to the audience and answered questioned from the jury for the Cleantech Company of the Year Award. The pitches proved once again that there are indeed an excellent range of companies in Sweden and that they now to a larger degree have reached further and are active in sales and have customers. This was a very good sign and encouraging for the whole audience. 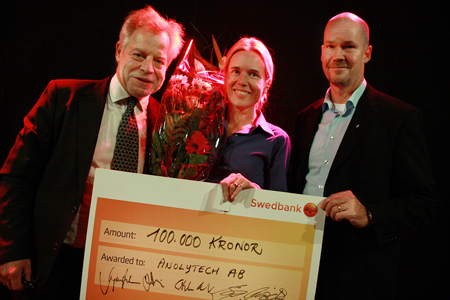 The jury had a very tough time in selecting a worthy winner among the companies presented. Malmberg Water, Veolia Innovation and Carbon Trust contributed towards the view of how companies can develop, how they have set an example and what assistance is available. The conference ended with three parallel workshops covering current industry topics, and, during the evening, a gala dinner was held at which the winning company was announced – Anolytech AB, the green bacteria killer. I was very pleased with the outcome of the event but specifically to hear the intensity of meetings and discussions, and the eagerness to make new contacts during the day. This is exactly what the Stockholm Cleantech Venture Day is about; to set a scene for meetings between investors and entrepreneurs and to provide new insights for the industry. With a few days retrospect, I can say that I am pleased to be part of the industry, that there continues to be an increasing demand for good solutions and that the innovators of this industry truly are fantastic in developing new solutions throughout the whole spectrum of technologies.